Vice correspondent Hamilton Morris announced in June of this year that he’s working on “an hour long doc about mushroom hunting and cultivation” for Vice’s cable channel Viceland. 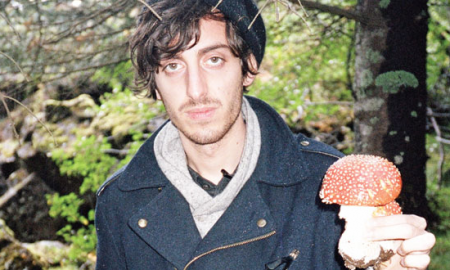 If you haven’t heard of Hamilton Morris previously, he has his own series with Vice called “Hamilton’s Pharmacopeia” where he travels the world partaking in and studying the world’s psychoactive chemicals and the altered states of consciousness these drugs produce. 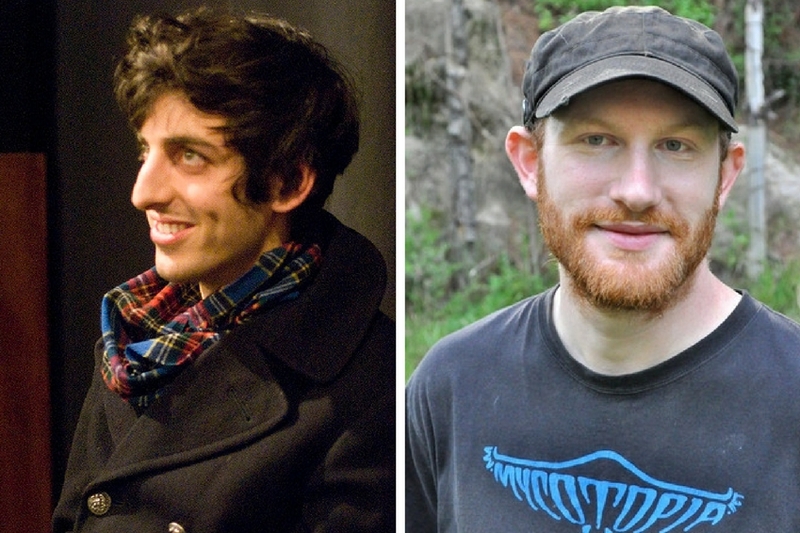 Here’s an episode in which Hamilton Morris travels to intereview Alexander “Sasha” Shulgin, the tryptamine and phenethylamine chemist par excellence, before his passing in 2014. Alan Rockefeller is one of the most prominent mycologists today, traveling through North and Central America studying various species of Psilocybe and other fungi. There was talk within the mushroom identification groups earlier last month that Alan was shooting a documentary with Vice in Jalisco, Mexico. Alan expressed his excitement in working with Vice film crews. Being much more comfortable capturing fungi with his camera, Alan admitted a certain degree of relief knowing that he wouldn’t have to bare the stress of filming the entire foray. 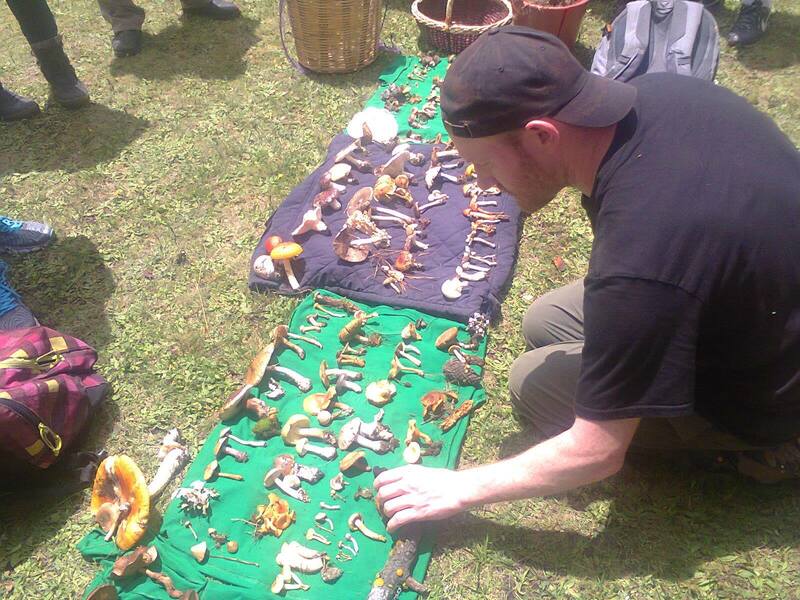 Here he is in Oaxaca identifying mushrooms collected by a group of hunters during a foray. So how does this play into Hamilton’s Pharmacopeia? 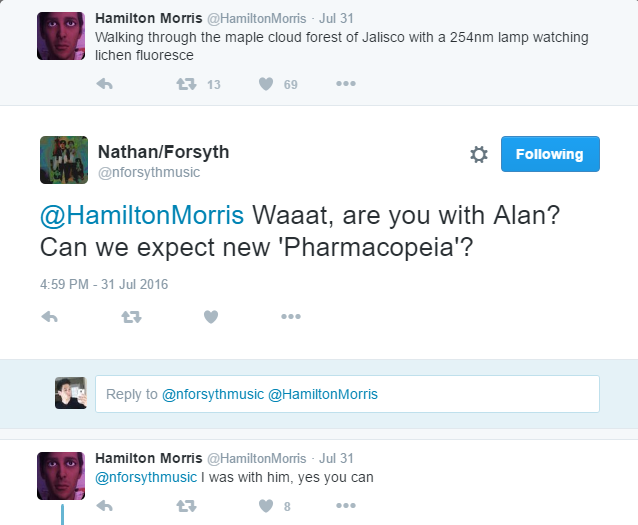 Well, in late July, I noticed Hamilton tweeting crossing the tropical landscapes of Guadalajara while carrying plates of Psilocybe zapotecorum mycelium. I found this intriguing since all of the talk of Alan being on Vice and considering that Hamilton and Alan were already mutual friends on Facebook, I got curious. My brother, musician, Nathan Forsyth, managed to tweet at him first. So, there you have it, straight from the horse’s mouth. I guess Hamilton could be talking about any Joe Schmoe named Alan and maybe this is all coincidence, but aren’t the connections a little too strong? After watching Alan display expert-level skills at identifying fungi, create a local community devoted to sequencing the fungal genome, and proliferate a fact-based approach to mushroom education, I’m sure you can understand the joy I felt upon learning of Alan and Hamilton’s collaboration. If you want to know when the documentary will be released, I’m sure you could tweet at Vice, Hamilton, or Alan himself and you MIGHT get an answer. But you can be sure we’ll be announcing it to our email list as soon as it comes out so get notified and subscribe! Have anything interesting to add? Leave it in the comments below! There are practically no personal details on this guy. Meanwhile, a quick Google displays my entire life. I just want to verify the paper trail that this dude is not part of the NWO rockefeller’s who desire to consolidate their positions at the expense of the rest of the meritable folk who are their objective equals or superiors in intelligence and aptitude. All I want is to be on level ground. I can’t even get this guys age while you can get my specific location and literally everything on me by Googling my name and city. NO worries buddy, despite your rather over the top paranoia. “Rockefeller” is a pseudonym, and Alan just turned 40. But he is a real person, and does come from less lofty money, although I wouldn’t really call him “one of the most prominent mycologists today,” since he is only another dedicated amateur, with an over-weaning online presence and more than a modicum of paranoia. Just for the record, I was also approached by the folks at Hamilton’s Pharmacopia, for a muscaria segment, but I checked their work (their segment on ketamine was laughably bad!) and was highly reluctant to get involved. I finally agreed to meet with them, although I immediately regretted saying so, but the gods intervened and all of their video equipment was stolen in SF and I got to wiggle offa the hook! Phew! My name is Debbie Viess, and I approved this message. Google away! Alan Rockefeller is a pseudonym. It’s not his legal name. 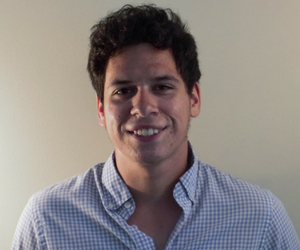 John has been studying fungi for fun since his late teens after becoming aware of his local Psilocybe species. Now, at age 25, he would now like to distribute and curate mycological knowledge to anyone willing to learn about an underappreciated organism. Though not quite expert status, he still believes mycology doesn’t have to be an inaccessible field, hence this blog.